Successfully Added Quadro - Quadband Cell Phone with Four SIM Card Slots to your Shopping Cart. 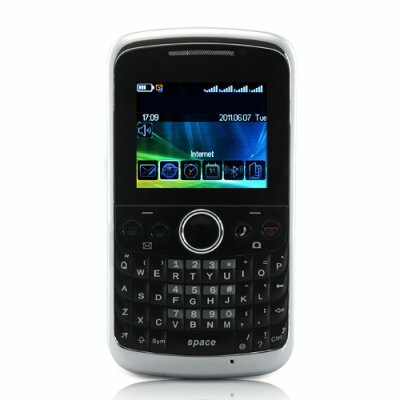 Let the Quadro GSM Quadband Cell Phone keep your private number truly private. With four SIM Card slots, this unlocked mobile phone is the ultimate business solution and ideal for high end connectivity in the world of communication. Use 4 different numbers for 4 different purposes and keep your private number yours. Say hello to the Quadro! Beautiful and brilliant, this unlocked mobile phone is a must for those who have to be at the forefront of leading edge technology and comes with 4 (yes four!) SIM card slots. Why would anyone need four SIM card slots? One for Travel: Heading overseas for Christmas? Then make sure to keep an international pay-as-you-go SIM card ready and available! Making calls on your next trip can be easier and cheaper when you're prepared. For those who want more, the Quadro Quadband Cell Phone also comes with solid array of full featured functionality, including: A camera and camcorder, video and music player, FM radio and e-book reader, analog TV, Bluetooth, Java, full QWERTY keyboard, and much, much more. With the Quadro, you'll always have a reason to love your phone. As always, Chinavasion brings you the latest gadgets from the world's factory (China) at an unbeatable wholesale price. To see this phone in action and make a killing as a drop shipper or a reseller, click "Add to Cart" right now, select your preferred shipping method from our 4 courier options (DHL, UPS, FEDEX, EMS) and in a few days, this amazing quadband quad-SIM cellphone will be yours. And of course, it comes with our celebrated 12 month warranty and guaranteed customer satisfaction! If I don't have 4 SIM cards, can I just use 2 or 3 with this phone? Yes! Even if you only have 1 SIM card, you can still enjoy all the amazing functions of this phone.